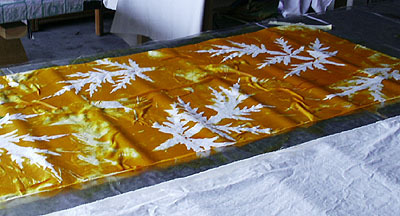 Here is a view of most of the length of cloth, with the yellow layer completed. Next I used an aqua color, with the same process as before. 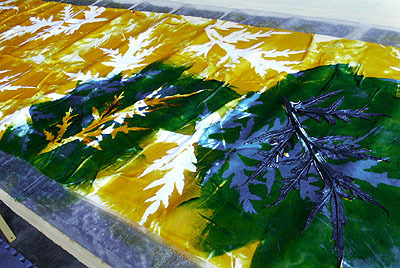 In this view, you can see a leaf still in place on the fabric, where it was acting as a resist to the aqua dye. Of course, where the aqua overlaps the yellow, a lovely green appears! 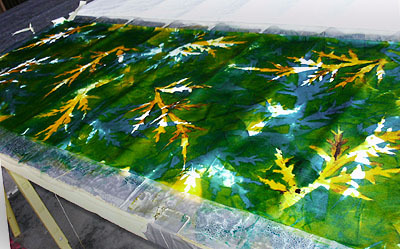 Here is the cloth after the first two layers of color have been completed. 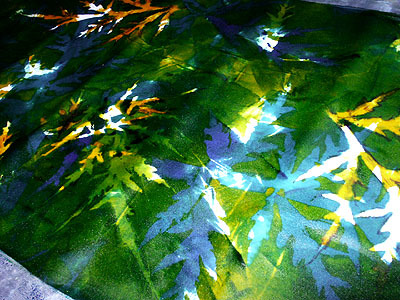 There seems to be a bit of rust color in some of the leaf-shapes, as well as the yellow and aqua I've applied. The rust is undoubtedly left from a previous day's activity, when I used that color on the same leaf that I used here. I welcome such singularities! I've added a third layer, of a different blue. The piece is still far from finished, but you get the idea; I keep adding layers of color, using the artichoke leaves as a resist with each color.